Wondering where you should begin? To get inspired and ideas for your project, tear pictures from magazines, and print images from online design sites. Create a project file with these pictures and share your thoughts with your architectural designer. The perfect design styles and colors with just the right room accents will help you create a living space that truly reflects your style. Our company design professionals are here to help you define your style, consult you on how colors can enhance a room, and to fill you in on the latest design and color trends. 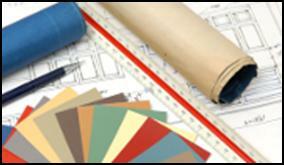 Our design professionals have ideas and most importantly solutions that are perfect for your lifestyle and interests. We have the solutions that reflect your life and make your home function perfectly for YOU. Once you’ve identified the type of style and overall look and feel that you’d like your renovation and the rooms to reflect, it’s time to consider finish design options. Browse through product & cabinet books by type, finish, size of trim, and for your cabinets, the finish, door style, or wood type to help you narrow down the list of possibilities. We not only have function and storage solutions that are perfect for your every need, but we also provide you with the decorative trim and molding enhancements that will beautifully accent your home’s architectural elements and make a true design statement. We can’t emphasize that enough. Throughout the process of designing, selecting & purchasing materials, cabinetry, you will need to work closely with an architectural designer that can ensure there are no mistakes. Mistakes can not only cost you a lot of money on special ordered materials that cannot be returned, but also it can affect tradesmen schedules and the projects completion time line. Our professionals will help you properly measure your space, determine the ideal renovation plan for your home, whether it’s a new addition, kitchen work triangle or a great bathroom layout. A perfect space that reflects your personality and lifestyle. A home of harmony where there is a place for everything and the overall look and feel is something out of the magazines.